Fig. 1-2-2-1 shows the number of persons newly received by public prosecutors offices for violations of the Minor Offenses Act (Act No. 39 of 1948) and the Firearms and Swords Control Act over the last 20 years (See Appendix 1-4). The number of persons received for Minor Offenses Act violations has been on an increasing trend in recent years with that trend being particularly noticeable from 2004 on. The number of persons received in 2009 was 16,396 (up 5.0% from the previous year), approximately 1.5 times that in 2004. 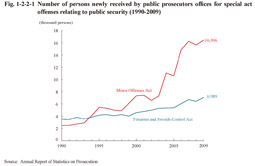 This increase was mainly due to an increase in the number of persons cleared for the offense of carrying weapons (violation of item 2, Article 1 of the said Act) or for breaking into a prohibited place or a field of other persons (violation of item 32 of the said Article) (Source: Criminal Statistics by National Police Agency). 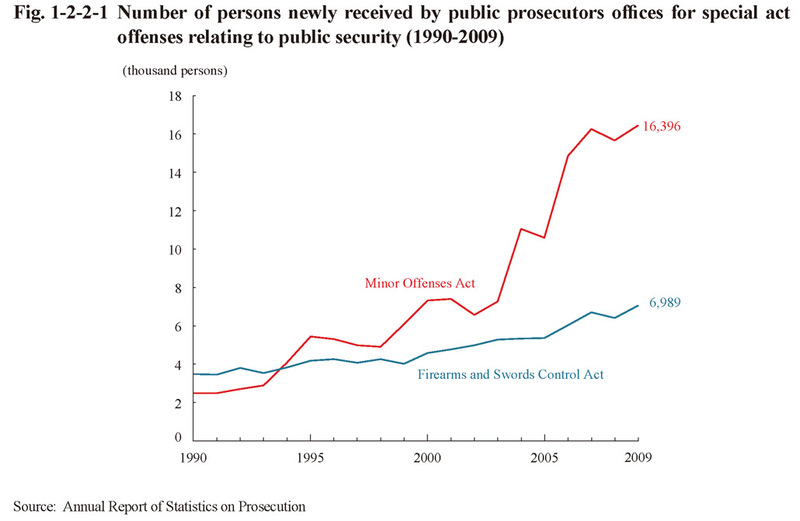 The number of persons received for Firearms and Swords Control Act violations has also been on an increasing trend in recent years and was 6,989 (up 10.0% (id.)) in 2009. Amendment of Firearms and Swords Control Act by Act No. 86 of 2008 expanded the scope of prohibition on possession of swords by lowering the length of the blade from 15 cm to 5.5 cm (enforced on January 5, 2009). The number of persons newly received by public prosecutors offices for violations of the Act on Prohibition of Possession of Special Picking Tools, and Other Related Matters (Act No. 65 of 2003) has been decreasing every year since 2007, and was 564 (down 2.9% from the previous year) in 2009 (See Appendix 1-4).